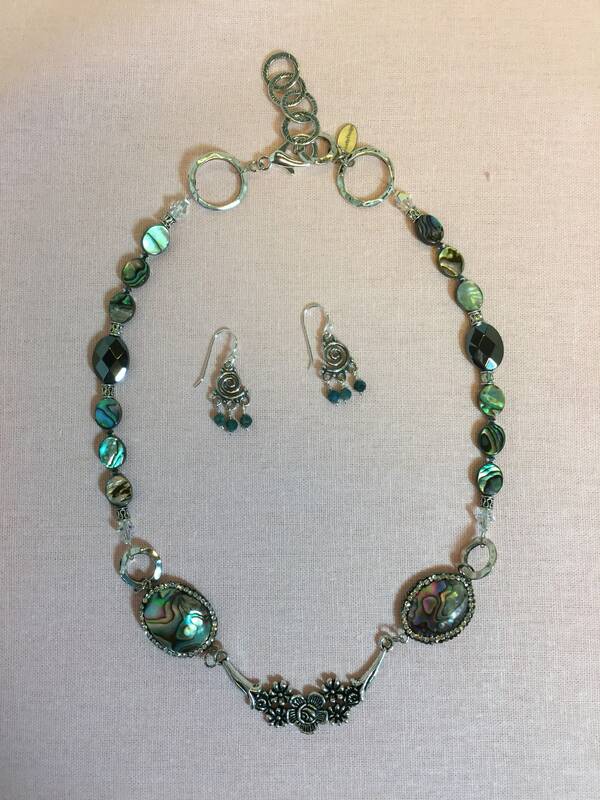 This single strand necklace features a pewter flower with abalone rounds and hematite discs. 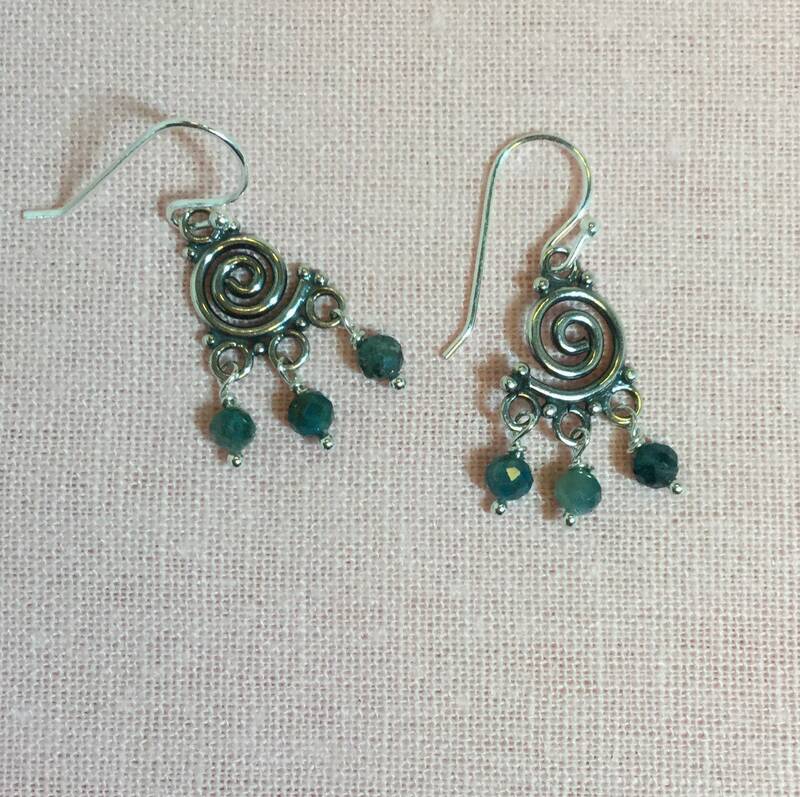 The matching earrings dangle tiny apatite beads from sterling spirals. The ear wires are silver. Before you purchase a necklace, you’ll want to make sure it fits you properly. If you look online, you’ll see various aids for measuring. A simple method is to measure your neck just above the collarbone and add up to four inches for the drop. My neck measures 15 inches, which means I can wear a necklace of 19 inches. This is a bit simplified, however, because your height and the size of your shoulders will also affect how a necklace fits you. 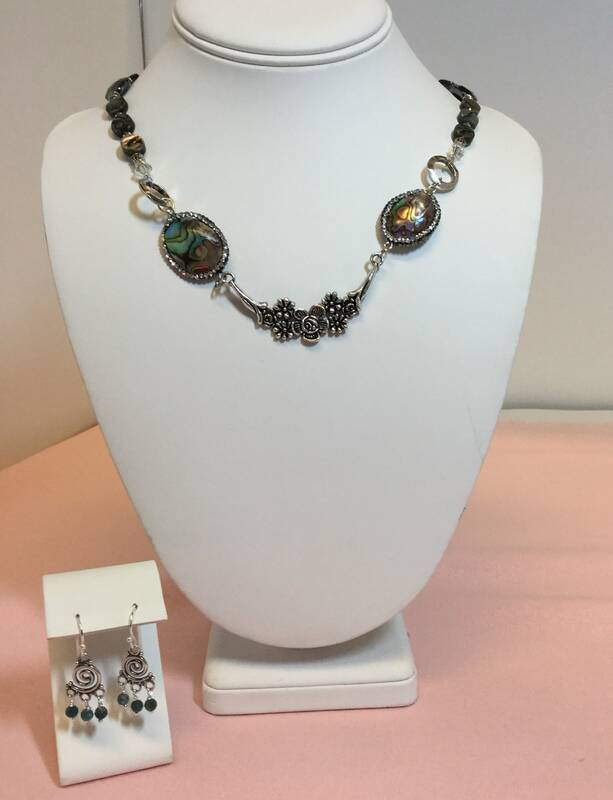 Of course, you will also want to decide where you’d like the necklace to hang as well. See the next two FAQs below for a more specific method and a chart with common sizes. To be more precise in your measurements, try measuring your neck first, then measure your drop: from the collarbone to the top of your breastbone. Add the two. My neck is 15 and my drop is 4 inches, so 19 inches should work well for me. In some cases, your neck might be smaller and your drop longer. An alternative method is to find a necklace in your collection that you really like and measure it. Just hold the necklace up and measure from the clasp to the bottom, then double it. Keep in mind that the style of the necklace will also affect what size works for you. A necklace with a pendant will be longer and will need the right type of neckline to show well. All of the necklace sizes listed in my shop are exclusive of the pendant. Should circle your neck snugly. Buy a necklace that matches your neck size with just a bit of extra room so it won’t be too tight. This length should fall just below your collarbone and will go well with high necklines like a crew neck. This is the perfect length for a necklace that shows off a pendant and will hang just to the top of your breastbone. Falls below the neckline and will work well with a high neck like a turtleneck. I recommend you use your measuring tape to see how a certain length will look on you. If you’d like to custom order an item just click on the “Custom Order” link to begin the process. I’ll need some preliminary information, and then we can chat about your lifestyle and clothing and visual preferences. Please note that I will need to collect a deposit before I begin working. Makes its statement with at least two of the following symbols: a peace sign, a flower, a feather, a crystal, a leaf. Refines the Hippie Chick statement by adding an element or two representing the great state of Texas: a hat, a boot, a horseshoe, a cactus, a space shuttle, an astronaut, an oil derrick. Adds benefits drawn from a healing chakra stone. Celebrates the knowledge and experience of the women in our lives by displaying a unique owl pendant. Honors a symbol associated with an ancient civilization: a labyrinth, a mandala, a Hamsa hand, an Egyptian god, etc. Commemorates your ancestors’ cultural heritages. Measure your wrist below the wrist bone (where you would normally wear your bracelet) using a measuring tape. Add to your wrist measurement using the chart below, depending on how you’d like the bracelet to fit.